Lipodystrophy, the abnormal distribution of fat, encompasses lipoatrophy, the loss of fat, and other abnormalities of adipose tissue. Generalized lipoatrophy, also known as Lawrence-Seip syndrome, is a rare group of syndromes, either acquired or congenital, characterized by a near-complete absence of fat. See the image below. Acquired generalized lipoatrophy is in the differential diagnosis of congenital generalized lipoatrophy. This patient, who had completely normal fat distribution at age 3 years 8 months (left), acutely lost her body fat with a febrile illness at age 6 years 10 months (right). The clinical problems requiring treatment in lipoatrophy syndromes are diabetes and hypertriglyceridemia. Although several classes of antidiabetic drugs are marketed in the United States, achieving good glycemic control (glycated hemoglobin < 7.2%) is difficult for most patients with lipoatrophic diabetes. The dyslipidemia of severe lipoatrophy is difficult to treat with currently available therapeutic interventions. In addition, lifestyle modifications alone may not be sufficient and may need to be implemented along with pharmacotherapy. Troglitazone is remarkable in its ability to improve hypertriglyceridemia in addition to improving glycemia. Some clinicians also prefer to use fibrates and statins rather than niacin because of severe insulin resistance. Clinical spectrum of adiposity. T1-weighted magnetic resonance images in which lipid appears white. Transverse sections of the torso at the level of the fifth lumbar vertebra (top panels) and of the midthigh (bottom panels). 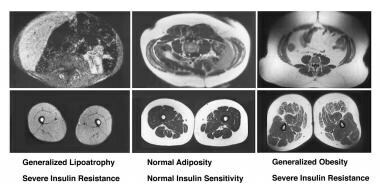 Generalized lipoatrophy (top left, bottom left), a healthy individual with a body mass index (BMI) of 24 kg/m2 (top center, bottom center), and an individual who is obese with a BMI of 38 kg/m2 (top right, bottom right). Note the marked absence of all fat depots in the patient with generalized lipoatrophy, with preservation of marrow fat and a lipid-filled liver. In addition, the bright color of the muscle is indicative of lipid-filled myocytes. This article focuses on the syndromes at one extreme of the spectrum: generalized lipoatrophy, also known as Lawrence-Seip syndrome. These are a rare group of syndromes characterized by a near-complete absence of fat. Generalized lipoatrophy may be acquired or congenital. The primary focus of this article is on the genetic syndromes that cause a near-complete absence of fat tissue. However, other diseases are mentioned because they relate to the topic of discussion. Congenital generalized lipoatrophy in a 16-year-old girl. In T1-weighted magnetic resonance imaging (MRI) scan, transverse sections of the torso at the fifth lumbar vertebra demonstrate markedly deficient subcutaneous and visceral fat (top left). Transverse sections of the midthigh demonstrate an absence of subcutaneous fat, deep fat, intrafascicular fat, and marrow fat (bottom left); note light-colored, lipid-filled muscle tissue. Note absence of fat throughout the body (right). Dunnigan familial partial lipodystrophy in a 26-year-old woman. Note increased fat around the face/neck (top left) and deficiency in the gluteal region and lower extremities (top right). T1-weighted magnetic resonance imaging (MRI) scan of transverse sections of the torso at the fifth lumbar vertebra demonstrate markedly deficient subcutaneous fat and increased visceral fat (bottom left). Transverse sections of the midthigh demonstrate absence of subcutaneous fat, with preservation of deep fat, intrafascicular fat, and marrow fat (bottom right). In this article, the loss of fat is referred to as lipoatrophy and the abnormal distribution of fat is referred to as lipodystrophy. The term lipoatrophic diabetes refers to diabetes mellitus in association with lipoatrophy. Lipodystrophy encompasses lipoatrophy and other abnormalities of adipose tissue. The focus of this review is on syndromes characterized primarily by adipocyte deficiencies throughout the body. Another distinction is between syndromes of (1) lipoatrophy, in which an actual insufficiency of adipocytes and/or precursor cells is present and results in metabolic disturbances, and (2) other states of total body fat deficiency, in which the adipocytes are basically normal but are chronically forced to mobilize their stored triglycerides (eg, chronic energy [caloric] depletion, exercise, increased sympathetic drive. [20, 21, 22, 23] In the latter group, the adipocytes are still capable of functioning at a level sufficient to prevent metabolic consequences. The use of genetic engineering approaches that disturb only triglyceride storage into the adipocytes (eg, by perturbing the insulin receptor specifically in the adipocytes  or by disrupting perilipin protein that coats lipid droplets in adipocytes)  does not lead to metabolic syndrome. Perilipin-null mice have a greater lean body mass and are more resistant to diet-induced obesity than wild-type mice, although compared to wild-type mice who weigh over 30 grams, perilipin-null mice who weigh over 30 grams may have an increased tendency to develop glucose intolerance and peripheral insulin resistance. Interestingly, plasma leptin concentrations in perilipin-null mice are greater than expected given the decrease in fat mass. This increased leptin might explain the relative absence of lipoatrophic symptoms, such as severe hyperinsulinemia, elevated blood lipids, fatty liver, and organomegaly, in the perilipin-null mice. Over the last decade, important advances have occurred in understanding the differentiation program of adipocytes. Precursor cells are committed to adipogenesis through transient expression of certain transcription factors such as CCAAT/enhancer-binding protein-beta (C/EBP–beta) and C/EBP-delta and thus become preadipocytes. Preadipocytes gain the ability to store triglycerides and repress cell-cycle genes through the activation of multiple genes controlled by key transcription factors (ie, peroxisome proliferator-activated receptor-gamma [PPAR-gamma] and C/EBT-alpha). Other transcription factors are involved either in activating these key factors or in controlling the synthesis of their ligands (eg, sterol regulatory element binding transcription factor 1 [SREBP1]/adipocyte determination and differentiation factor 1 [ADD1] may regulate synthesis of ligands for PPAR-gamma). Defects in both of these commitment steps may lead to adipocyte deficiency. Another mechanism for adipocyte deficiency is through increased destruction of these cells (eg, induction of apoptosis). The exact control of adipocyte turnover or constant remodeling in adults is not understood. A novel molecule called lipin has been cloned as a result of positional cloning efforts to identify the genetic etiology of a naturally occurring mouse model with partial lipoatrophy and fatty liver. This molecule is a novel protein with nuclear localization and is induced during adipocyte differentiation. Its exact role in the adipocyte differentiation pathway remains to be identified. Adipose tissue is an endocrine organ, an important concept that was proven by the discovery of the hormone leptin. Adipocytes communicate body fat levels to the neuroendocrine system to control food intake and energy expenditure. Leptin has effects (direct or indirect) on the key organs of metabolism, including the liver, muscle, and pancreas. Another intriguing signal originating from adipocytes is a 30-kd molecule called adipocyte complement–related protein 30 (ACRP 30)  or adipoQ. Other independent groups that have cloned this molecule called it adipocyte most abundant gene transcript 1 (APM1). Now it is most commonly called adiponectin. This molecule appears to be important in inducing fat oxidation in the muscle and liver. It promotes insulin sensitivity and is found to be decreased in various forms of insulin resistance. Lack of adipocytes results in deficiency of these signals, contributing to many of the abnormalities observed in persons with syndromes characterized by an absence of fat. There are 2 consequences of fat loss that could explain the insulin resistance and other metabolic abnormalities seen in lipoatrophy syndromes. One is that the inability to store triglycerides in adipocytes leads to abnormal deposition of triglycerides in other tissues such as the liver, skeletal muscle, and pancreas (lipotoxicity), resulting in hypertriglyceridemia, insulin resistance, hepatic steatosis (fatty liver), impaired insulin secretion and eventually type 2 diabetes. Both leptin and adiponectin promote the storage of fat in adipose tissue and inhibit the deposition of excess fat in other tissues such as liver and muscle. These hormones can also promote free fatty acid oxidation in skeletal muscle and liver, increase glucose uptake and decrease hepatic gluconeogenesis. Leptin replacement therapy is currently being used as an investigational therapy in patients with lipoatrophy syndromes. Adiponectin replacement has not yet been studied in humans, although animal studies suggest that it may also have some benefit by significantly improving insulin sensitivity. Absence of fat can be partial or generalized, and the syndrome can manifest at birth or later in life. [1, 2] If fat loss is partial, the residual fat undergoes compensatory hypertrophy. Usually, a rough correlation exists between the severity of metabolic consequences and the degree of fat loss. An entity exists called focal lipoatrophy, in which the loss of fat involves a single region in the body such as the gluteal area, usually following intramuscular injections,  or on the face (ie, Romberg syndrome). Other specific distributions are reported in the literature, and other descriptive terminology is used, including annular or semicircular lipoatrophy [37, 38] (see Lipodystrophy, Localized). Therapy with protein hormones such as insulin [5, 6] and growth hormone  also may lead to focal lipoatrophy. Usually, the isolated loss of fat from a limited body region is not associated with metabolic consequences, supporting the hypothesis that a crucial degree of fat loss is required to observe the metabolic abnormalities. While the various lipodystrophy syndromes can be classified in many ways, one proposed scheme is demonstrated in Table 1 in Treatment of Lipoatrophy/Lipodystrophy. This syndrome has an autosomal recessive (AR) mode of inheritance and has been described in persons of all ethnic groups. Arioglu et al observed a sexual dimorphism in the severity of metabolic complications: female patients manifest diabetes and hypertriglyceridemia much earlier and usually more severely than male siblings in the same family. The protein product of the seipin gene is most likely a signaling molecule. It has 3 trans-membrane domains, and the ligand is not known. The mouse ortholog of the gene is a G-protein–related receptor gene. Contrary to the predictions that prevailed prior to the discovery of this gene, seipin is not abundantly expressed in fat cells. It is expressed predominantly in the central nervous system and especially in the pituitary. Another location where it is expressed in high levels is the testes. As evident from these facts, the discovery of the seipin gene has led to many new questions and is likely to change current views on adipocyte differentiation mechanisms. This exciting discovery also underscores the potential link between the central nervous system and the energy storage sites of the body. Some CGL pedigrees do not have mutations in either of these two genes. Therefore, other causative genes must be involved. In addition, subjects with the same genetic mutation can have widely different clinical manifestations. This suggests that other genes, the environment, or both may also play a role. Werner syndrome in a 37-year-old woman (left). Clinical features evident include premature aging, alopecia, sclerodermalike changes in the skin, and peripheral lipoatrophy (shown). Insulin-resistant diabetes is an associated feature. On the right is mandibuloacral dysplasia in a 14-year-old girl. This rare recessive syndrome is characterized by acroosteolysis, widened sutures, and hypoplastic mandible (shown) and clavicles (shown). Marked peripheral lipoatrophy and insulin resistance are associated features. There are autosomal dominant (AD) forms of congenital lipodystrophy (characterized by an absence of fat from the face, upper trunk, arms, and below the knees) associated with a progressive neurodegenerative disorder (characterized by progressive spinocerebellar ataxia, pyramidal weakness and spasticity, and autonomic insufficiency) and congenital cataracts. In this small pedigree, affected individuals also have insulin resistance and dyslipidemia, and both the neurodegenerative disorder and dyslipidemia are more severe in affected female members. Some unusual congenital disorders, such as vitamin D resistance and persistent müllerian ducts,  retinal pigmentation abnormalities  and sensorineural deafness,  have been reported in association with lipodystrophy in isolated cases. These unusual patients present as pediatric patients or young adults. Other complex monogenic syndromes are not characterized as primary lipodystrophy syndromes but are associated with abnormal body fat distribution, among other complex abnormalities. 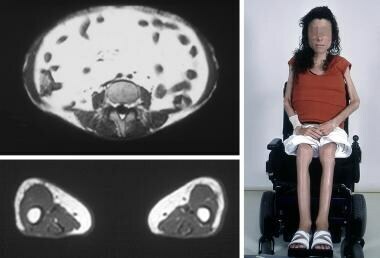 Progeria syndromes, such as Werner syndrome (adult progeria syndrome, see first image above),  Cockayne syndrome (a juvenile progeria syndrome), [57, 58] carbohydrate-deficient glycoprotein syndrome type 1,  SHORT (short stature, hyperextensibility, hernia, ocular depression, Rieger anomaly, and teething delay) syndrome, [60, 61] and mandibuloacral dysplasia [62, 63] [see image above]), are among such conditions. Acral, renal, and ectodermal dysplasia in association with generalized lipodystrophy (AREDYLD) syndrome  probably represents another complex progeria syndrome. Mandibuloacral dysplasia is another genetic disorder with multisystem involvement and AR inheritance. This extremely rare syndrome is characterized by multiple skeletal abnormalities, acroosteolysis, and joint and skin problems and is associated with lipodystrophy and metabolic abnormalities. [62, 63] Two forms of lipodystrophy have been observed in patients with mandibuloacral dysplasia. Type A involves partial loss of subcutaneous adipose tissue from the extremities. Type B involves a more generalized loss of subcutaneous adipose tissue from the face, trunk, and extremities. Also referred to as Kobberling-Dunnigan syndrome, familial partial lipodystrophy (FPLD) or Dunnigan syndrome (see image below) is inherited in an AD fashion. It is observed mostly in white persons of northern European descent, but pedigrees of persons of Asian descent have also been described. Although the condition is rare, pediatricians may be presented with the question of whether a child of an affected parent also has the disease. Distinguishing affected patients from unaffected patients before the onset of puberty is usually impossible. Patients are born with normal fat distribution but notice a loss of subcutaneous fat in the extremities and in some cases also the trunk with early puberty, which produces a muscular appearance with prominent superficial veins. This is followed by increased fat in the face and neck as puberty is completed. [9, 10] The visceral fat and interfascicular intramuscular fat depots are preserved. [11, 12] The Kobberling subtype, sometimes referred to as FPLD1, is characterized by loss of subcutaneous adipose tissue from the extremities only, whereas Dunnigan syndrome, or FPLD2, is characterized by loss of fat from the extremities and trunk. An exciting advance in the understanding of the syndrome has been the discovery that the disease is caused by mutations in the lamin A/C gene (LMNA) located at band 1q21-23. [67, 68, 69, 70, 71] Lamin A and C are alternatively spliced products of the same gene and are ubiquitously, but not equally, expressed. They belong to a family of intermediate filament proteins that form the nuclear matrix, [73, 74] which is located just inside the nuclear membrane. Lamins dimerize and oligomerize within the structure of the nuclear matrix. Developmental regulation of the expression of lamins occurs in humans. In addition to Dunnigan syndrome/FPLD, 2 other diseases are associated with mutations in LMNA. The first is Emery-Dreifuss muscular dystrophy, which is a progressive muscular dystrophy of the upper and lower extremity muscles, with prominent contractures of ankles and elbows and cardiac conduction abnormalities. [75, 76] The other is a familial cardiomyopathy associated with conduction abnormalities [77, 78] The degree of overlap between these 2 diseases and FPLD is a subject of research. In addition, how the mutations in LMNA result in 3 different diseases and how the mutations in a ubiquitously expressed gene cause various syndromes with a strong regional distribution are questions that remain unanswered. A third form of familial partial lipodystrophy, FPLD3, was first identified in a patient who developed diabetes mellitus and hypertriglyceridemia at age 32 and loss of fat from the extremities and face at age 50 years. This patient had a mutation in the PPAR-gamma gene, which encodes peroxisome proliferator-activated receptor-gamma, the target of the thiazolidinedione medications used to treat insulin resistant diabetes. Heterozygous mutations in the PPAR-gamma mutation have since been identified in several other patients with FPLD. In these patients, the onset of lipodystrophy occurred as early as the second decade of life. All affected patients had loss of subcutaneous adipose tissue from the distal extremities. The face was spared in some and affected in others. More recently, a mutation in the AKT2, or protein kinase B, gene has been identified in a patient with FPLD affecting only the extremities. Many patients with FPLD do not have mutations in Lamin A/C, PPAR-gamma, or AKT2. Therefore, other genetic loci for FPLD likely exist and have yet to be identified. Loss of muscle and fat tissue in a 19-year-old woman with severe juvenile dermatomyositis and generalized lipodystrophy. T1-weighted magnetic resonance imaging (MRI) scan of transverse sections of the patient's torso at the fifth lumbar vertebra demonstrate markedly deficient subcutaneous fat and markedly increased visceral fat (top left). Transverse sections of the midthigh demonstrate asymmetrical absence of subcutaneous fat, with preservation of medial subcutaneous fat and marrow fat (bottom left). A portion of patients with acquired lipodystrophy have low C3 levels,  and adipsin, a factor produced by fat cells, is thought to be responsible for alternative activation of the complement pathway. In addition, generalized or partial fat loss has been described in association with familial  or acquired [84, 85, 86] hypocomplementemia. A clear association exists between lipodystrophy and juvenile dermatomyositis. [87, 88, 89, 90] These patients typically present before adolescence. The fat loss can be either generalized or partial. Usually, increased visceral fat is present despite very severe peripheral fat loss and a specific asymmetrical pattern of fat loss on the extremities (see image below). Two specific eponyms are used in the literature to refer to acquired lipodystrophy syndromes, Lawrence syndrome and Barraquer-Simons syndrome. These eponyms are mostly descriptive and do not necessarily indicate diseases caused by a unique etiology. These terms should perhaps be replaced by acquired generalized or acquired partial lipodystrophy, respectively. Lawrence first described acquired generalized lipoatrophy (also known as Lawrence syndrome) with the onset of the disease during childhood. Additional case reports in the literature indicate that acquired generalized lipoatrophy can present at any age. Lawrence's original report remains an excellent description of generalized lipoatrophy. Fat loss is usually a remarkable event leading to a dramatic change in physical features. The median time to develop diabetes after loss of fat tissue is approximately 4 years. Both the basal metabolic rate and hepatic glucose output are increased. While these patients are known to lack fully differentiated adipocytes, whether they also lack adipocyte precursors remains unclear. Patients with this type of lipodystrophy may have very severe fat loss, including retro-orbital fat and supportive fat in their hands, feet, and genital area. Bone marrow fat is lost in some cases, but preserved in others. The case reports that refer to Barraquer-Simons (or acquired partial lipodystrophy) syndrome describe a wide range of variation with few shared features. Patients are usually women in their second or third decade of life who also have well-described autoimmune disorders such as scleroderma or glomerulonephritis presenting with partial fat loss. [2, 94, 95] Fat loss usually starts in the face and descends to the gluteal line. Usually, increased adiposity is present in unaffected fat depots (lower extremities). The prevalence rate of diabetes and hypertriglyceridemia is approximately 50% in these cases and seems to cosegregate with lower total body fat in this series. Some patients who are infected with HIV and are undergoing aggressive treatment, particularly with protease inhibitors, develop a partial lipoatrophy characterized by loss of subcutaneous fat from the face, extremities, and trunk. In contrast, visceral fat increases, and a buffalo hump similar to that observed in persons with Cushing syndrome develops. [15, 16, 17] This is accompanied by the development of insulin resistance and hypertriglyceridemia. The changes in body composition and metabolic parameters are usually apparent within 3-6 months of therapy, and the onset is usually quicker when more than one protease inhibitor is used. The syndrome is recognized in persons of both sexes and in pediatric and adult patients. Further details about some specific forms of lipodystrophy can be found elsewhere (see Lipodystrophy, Acquired Partial; Lipodystrophy, HIV; Lipodystrophy, Progressive). In general, the more severe the lack of fat, the more severe the metabolic abnormalities (see Table 2 in Treatment of Lipoatrophy/Lipodystrophy). Circulating free fatty acid levels are increased in most patients studied at the US National Institutes of Health. Because of the relative paucity of adipose tissue, triglycerides accumulate excessively in multiple locations, most notably in the liver and in the muscles. Patients with congenital generalized lipoatrophy present with generalized absence of fat tissue within the first year of life. The musculature is typically well-defined with prominent superficial veins due to the paucity of adipose tissue. Severe hypertriglyceridemia may be present early on and result in eruptive xanthomas and recurrent pancreatitis. Insulin resistance is also present early on and acanthosis nigricans and type 2 diabetes usually occurs by adolescence. The accumulation of triglycerides in hepatocytes may somehow cause the injury associated with nonalcoholic steatohepatitis (NASH). NASH is observed in approximately one third of patients with lipoatrophy and may progress to end-stage liver failure with childhood death from bleeding esophageal varices. The insulin resistance leads to hyperinsulinemia, and clinical features of hyperinsulinemia (eg, acanthosis nigricans, hyperandrogenism in female patients) are common. Another notable finding in patients who are the most severely fat-deficient is food-seeking behavior. They may consume large amounts of food (similar to patients with bulimia) and may have the urge to eat frequently. They have low levels of circulating leptin, which may contribute to their increased appetite. Females with congenital lipoatrophy may exhibit clitoromegaly, hirsutism, or both at birth. The hirsutism usually increases with age. Reproductive abnormalities are common. Some women have hypogonadotropic amenorrhea, probably due to leptin deficiency. Many have a form of polycystic ovary syndrome, with irregular or infrequent menstrual cycles, hyperandrogenism, and ovarian cysts. Affected men usually have normal reproductive function. Acquired generalized lipoatrophy presents with widespread loss of adipose tissue in persons of any age. It has been reported to occur in persons as old as 74 years. Acquired forms of lipodystrophy are typically preceded by an illness, often an infection. A female preponderance appears to exist. Many of the same metabolic abnormalities that occur in the congenital lipodystrophies are also found in the acquired forms of generalized lipoatrophy, including insulin resistance, diabetes mellitus, hypertriglyceridemia, hypermetabolism, and low leptin levels. Mild hirsutism, prominent musculature and superficial veins, acanthosis nigricans, hepatomegaly and cirrhosis may also be present. Autoimmune disorders are common. Some patients may have an increased susceptibility to infection due to C3 deficiency. The clinical problems requiring treatment in lipoatrophy syndromes are diabetes and hypertriglyceridemia. Although several classes of antidiabetic drugs are marketed in the United States, achieving good glycemic control (glycated hemoglobin < 7.2%) is difficult for most patients with lipoatrophic diabetes. Because of their extreme insulin resistance, extremely high doses (eg, >1000 U/d) are often necessary in patients with various syndromes of lipoatrophy. The volume of injections is more difficult to tolerate for younger patients. Nevertheless, insulin remains the only approved medication for the treatment of children with diabetes. The principal mechanism of action for this class of drugs is to promote insulin secretion by beta cells. Because patients with isolated insulin resistance may not have an independent defect in insulin secretion, sulfonylureas are frequently ineffective in patients with lipoatrophic diabetes. Metformin primarily works by inhibiting hepatic glucose output. This drug may help decrease insulin requirements in some patients with lipoatrophy/lipodystrophy. To this author's knowledge, no systematic trials are investigating the efficacy of this drug in patients with lipoatrophy/lipodystrophy. Metformin is approved by the US Food and Drug Administration (FDA) for the treatment of type 2 diabetes in adults and children older than 10 years. Use of metformin in younger children is best administered by clinicians who have prior experience with treatment with this drug, ideally in facilities specialized in treating children with unusual forms of diabetes. Acarbose interferes with GI absorption of many carbohydrates. While this author is not aware of systematic studies on the efficacy of this drug in patients with lipoatrophy, it has relatively limited efficacy to decrease glucose levels in persons with type 2 diabetes mellitus. This author undertook a treatment trial with troglitazone in patients with lipoatrophy. The primary endpoints were metabolic control and adipose tissue mass. Six months of troglitazone therapy led to significant improvement in metabolic control, with a reduction in glycosylated hemoglobin (HbA1c), triglyceride, and free fatty acid levels. In addition, a small but statistically significant increase in body fat was noted. Interestingly, the increase was predominantly in the subcutaneous compartment. Furthermore, body weight did not change significantly and liver size deceased. Despite the favorable effects of troglitazone, a risk of hepatotoxicity was associated with therapy. The FDA withdrew troglitazone from the US market in March of 2000 because of concerns of hepatotoxicity. Despite the serious risk of hepatotoxicity, patients with lipoatrophy experienced significant clinical benefit from treatment with troglitazone. The newer members of the class, rosiglitazone and pioglitazone, remain in clinical use. The preclinical studies with these 2 medications suggest that they do not have the same risk of hepatotoxicity. In vitro, rosiglitazone has been shown to stimulate subepidermal fibroblast-like cells from an infant with congenital generalized lipodystrophy to differentiate into adipocytes. In patients with acquired partial lipodystrophy, one report showed that rosiglitazone improved fat distribution; however, preferential fat gain in the lower body occurred. The US Food and Drug Administration issued an alert on May 21, 2007 to patients and health care professionals regarding rosiglitazone potentially causing an increased risk of myocardial infarction (MI) and heart-related deaths following the online publication of a meta-analysis. Rosiglitazone is an antidiabetic agent (thiazolidinedione derivative) that improves glycemic control by improving insulin sensitivity. The drug is highly selective and a potent agonist for peroxisome proliferator-activated receptor-gamma (PPAR-gamma). Activation of PPAR-gamma receptors regulates insulin-responsive gene transcription involved in glucose production, transport, and utilization, thereby reducing blood glucose concentrations and reducing hyperinsulinemia. Potent PPAR-gamma agonists have been shown to increase the incidence of edema. A large scale phase III trial (RECORD) is currently underway that is specifically designed to study cardiovascular outcomes of rosiglitazone. As of September 2010, the FDA is requiring a restricted access program to be developed for rosiglitazone under a risk evaluation and mitigation strategy (REMS). Patients currently taking rosiglitazone and benefiting from the drug will be able to continue if they choose to do so. Rosiglitazone will only be available to new patients if they are unable to achieve glucose control on other medications and are unable to take pioglitazone, the only other thiazolidinedione. For more information, see FDA’s Safety Alert on Avandia. The online published meta-analysis entitled Effect of Rosiglitazone on the Risk of Myocardial Infarction and Death from Cardiovascular Causes can be viewed at The New England Journal of Medicine. Additionally, responses to the controversy can be viewed at the Heartwire news (the heart.org from WebMD) including the following articles: 1) Rosiglitazone increases MI and CV death in meta-analysis, 2) The rosiglitazone aftermath: Legitimate concerns or hype? and 3) RECORDinterimanalysisofrosiglitazonesafety:Noclear-cutanswers. The dyslipidemia of severe lipoatrophy is difficult to treat with currently available therapeutic interventions. This problem causes significant morbidity and mortality. Patients with triglyceride levels greater than 1000 mg/dL are at risk of developing acute pancreatitis. Recurrent episodes lead to pancreatic insufficiency. Chronically elevated triglyceride levels in the setting of hyperinsulinemia and low high-density lipoprotein (HDL) levels increase the predisposition for coronary artery disease. Severely elevated triglyceride levels may lead to painful cutaneous eruptive xanthomata. There is no evidence supporting the use of a specific diet for lipodystrophy. Total calories, saturated fat, and simple carbohydrates are typically restricted. A low fat diet is especially important if hypertriglyceridemia is present. In children, care must be taken to ensure that the energy intake is sufficient for normal growth and development. Alcohol should be avoided in patients with hypertriglyceridemia and fatty liver. Regular exercise should be encouraged to improve metabolic status. Lifestyle modifications alone may not be sufficient and may need to be implemented along with pharmacotherapy. Two encouraging interventions in mouse models of lipoatrophy are worth mentioning because they suggest novel therapeutic approaches for the treatment of patients with lipoatrophy. One intriguing experiment is transplantation of white fat into transgenic mice with severe lipoatrophy. This model exerted very severe metabolic abnormalities and had the least amount of white adipose tissue among the viable animal models of lipoatrophy. Transplantation of fat ameliorated the diabetes in a dose-dependent manner. This is currently a difficult therapy to undertake in humans because of the requirement for long-term immunosuppression and technical difficulties. Nevertheless, this experiment unequivocally establishes that insulin resistance and diabetes in lipoatrophy are caused by the absence of fat tissue. The results with leptin administration in another model of lipoatrophy are less dramatic, but they still demonstrate a significant effect on plasma insulin levels. These results from animal models warranted a clinical trial, which inspired a similar set of studies with a replacement approach of adipocyte-specific hormones, opening an era of rediscovery of the adipocyte as an endocrine organ. Garg A. 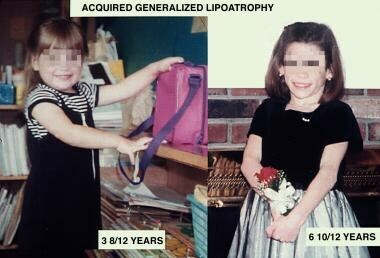 Acquired and inherited lipodystrophies. N Engl J Med. Mar 2004. 350 (12):1220-34. [Full Text]. Taylor SI, Arioglu E. Syndromes associated with insulin resistance and acanthosis nigricans. J Basic Clin Physiol Pharmacol. 1998. 9(2-4):419-39. [Medline]. Kayikcioglu A, Akyurek M, Erk Y. Semicircular lipoatrophy after intragluteal injection of benzathine penicillin. J Pediatr. 1996 Jul. 129(1):166-7. [Medline]. Rees TD. Facial atrophy. Clin Plast Surg. 1976 Oct. 3(4):637-46. [Medline]. Reeves WG, Allen BR, Tattersall RB. Insulin-induced lipoatrophy: evidence for an immune pathogenesis. Br Med J. 1980 Jun 21. 280(6230):1500-3. [Medline]. Murao S, Hirata K, Ishida T, Takahara J. Lipoatrophy induced by recombinant human insulin injection. Intern Med. 1998 Dec. 37(12):1031-3. [Medline]. Buyukgebiz A, Aydin A, Dundar B, Yorukoglu K. Localized lipoatrophy due to recombinant growth hormone therapy in a child with 6.7 kilobase gene deletion isolated growth hormone deficiency. J Pediatr Endocrinol Metab. 1999 Jan-Feb. 12(1):95-7. [Medline]. Copeland KC, Nair KS, Kaplowitz PB, Robbins DC, Calles-Escandon J. Discordant metabolic actions of insulin in extreme lipodystrophy of childhood. J Clin Endocrinol Metab. 1993 Nov. 77(5):1240-5. [Medline]. Dunnigan MG, Cochrane MA, Kelly A, Scott JW. Familial lipoatrophic diabetes with dominant transmission. A new syndrome. Q J Med. 1974 Jan. 43(169):33-48. [Medline]. Köbberling J, Willms B, Kattermann R, Creutzfeldt W. Lipodystrophy of the extremities. A dominantly inherited syndrome associated with lipatrophic diabetes. Humangenetik. 1975 Sep 10. 29(2):111-20. [Medline]. Garg A, Peshock RM, Fleckenstein JL. Adipose tissue distribution pattern in patients with familial partial lipodystrophy (Dunnigan variety). J Clin Endocrinol Metab. 1999 Jan. 84(1):170-4. [Medline]. Wildermuth S, Spranger S, Spranger M, Raue F, Meinck HM. 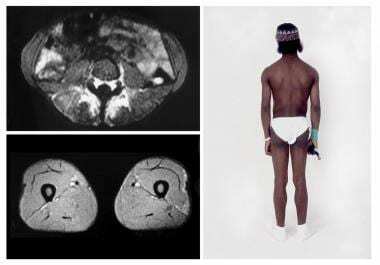 Kobberling-Dunnigan syndrome: a rare cause of generalized muscular hypertrophy. Muscle Nerve. 1996 Jul. 19(7):843-7. [Medline]. Peters MS, Winkelmann RK. Localized lipoatrophy (atrophic connective tissue disease panniculitis). Arch Dermatol. 1980 Dec. 116(12):1363-8. [Medline]. van Vonderen MG, van Agtmael MA, Hassink EA, et al. Zidovudine/lamivudine for HIV-1 infection contributes to limb fat loss. PLoS One. 2009 May 21. 4(5):e5647. [Medline]. [Full Text]. Carr A, Samaras K, Burton S, Law M, Freund J, Chisholm DJ, et al. A syndrome of peripheral lipodystrophy, hyperlipidaemia and insulin resistance in patients receiving HIV protease inhibitors. AIDS. 1998 May 7. 12(7):F51-8. [Medline]. Viraben R, Aquilina C. Indinavir-associated lipodystrophy. AIDS. 1998 Apr 16. 12(6):F37-9. [Medline]. Yanovski JA, Miller KD, Kino T, Friedman TC, Chrousos GP, Tsigos C, et al. Endocrine and metabolic evaluation of human immunodeficiency virus- infected patients with evidence of protease inhibitor-associated lipodystrophy. J Clin Endocrinol Metab. 1999 Jun. 84(6):1925-31. [Medline]. Agarwal AK, Garg A. Genetic basis of lipodystrophies and management of metabolic complications. Annu Rev Med. 2006. 57:297-311. [Medline]. Meyer L, Hadjadj S, Guerci B, Delbachian I, Ziegler O, Drouin P. Lipoatrophic diabetes mellitus treated by continuous subcutaneous insulin infusion. Diabetes Metab. 1998 Dec. 24(6):544-6. [Medline]. Waller EG, Wade AJ, Treasure J, Ward A, Leonard T, Powell-Tuck J. Physical measures of recovery from anorexia nervosa during hospitalised re-feeding. Eur J Clin Nutr. 1996 Mar. 50(3):165-70. [Medline]. Horská A. Use of magnetic resonance in body composition studies: applications to research on caloric restriction and exercise. Coll Antropol. 1998 Dec. 22(2):385-92. [Medline]. Aizawa-Abe M, Ogawa Y, Masuzaki H, Ebihara K, Satoh N, Iwai H, et al. Pathophysiological role of leptin in obesity-related hypertension. J Clin Invest. 2000 May. 105(9):1243-52. [Medline]. Yura S, Ogawa Y, Sagawa N, Masuzaki H, Itoh H, Ebihara K, et al. Accelerated puberty and late-onset hypothalamic hypogonadism in female transgenic skinny mice overexpressing leptin. J Clin Invest. 2000 Mar. 105(6):749-55. [Medline]. Kahn CR, Bruning JC, Michael MD, Kulkarni RN. Knockout mice challenge our concepts of glucose homeostasis and the pathogenesis of diabetes mellitus. J Pediatr Endocrinol Metab. 2000. 13 Suppl 6:1377-84. [Medline]. Tansey JT, Sztalryd C, Gruia-Gray J, Roush DL, Zee JV, Gavrilova O, et al. Perilipin ablation results in a lean mouse with aberrant adipocyte lipolysis, enhanced leptin production, and resistance to diet-induced obesity. Proc Natl Acad Sci U S A. 2001 May 22. 98(11):6494-9. [Medline]. Simha V, Garg A. Inherited lipodystrophies and hypertriglyceridemia. Curr Opin Lipidol. 2009 Aug. 20(4):300-8. [Medline]. Vantyghem MC, Balavoine AS, Douillard C, Defrance F, Dieudonne L, Mouton F, et al. How to diagnose a lipodystrophy syndrome. Ann Endocrinol (Paris). 2012 Jun. 73(3):170-89. [Medline]. Péterfy M, Phan J, Xu P, Reue K. Lipodystrophy in the fld mouse results from mutation of a new gene encoding a nuclear protein, lipin. Nat Genet. 2001 Jan. 27(1):121-4. [Medline]. Fruebis J, Tsao TS, Javorschi S, Ebbets-Reed D, Erickson MR, Yen FT, et al. Proteolytic cleavage product of 30-kDa adipocyte complement-related protein increases fatty acid oxidation in muscle and causes weight loss in mice. Proc Natl Acad Sci U S A. 2001 Feb 13. 98(4):2005-10. [Medline]. Hu E, Liang P, Spiegelman BM. AdipoQ is a novel adipose-specific gene dysregulated in obesity. J Biol Chem. 1996 May 3. 271(18):10697-703. [Medline]. Matsuzawa Y, Funahashi T, Nakamura T. Molecular mechanism of metabolic syndrome X: contribution of adipocytokines adipocyte-derived bioactive substances. Ann N Y Acad Sci. 1999 Nov 18. 892:146-54. [Medline]. Kadowaki T, Yamauchi T, Kubota N, Hara K, Ueki K, Tobe K. Adiponectin and adiponectin receptors in insulin resistance, diabetes, and the metabolic syndrome. J Clin Invest. Jul 2006. 116:1784-92. [Medline]. [Full Text]. Reue K, Phan J. Metabolic consequences of lipodystrophy in mouse models. Curr Opin Clin Nutr Metab Care. Jul 2006. 9:436-41. [Medline]. Reitman ML, Arioglu E, Gavrilova O, Taylor SI. Lipoatrophy revisited. Trends Endocrinol Metab. 2000 Dec. 11(10):410-6. [Medline]. Farooqi IS, Wangensteen T, Collins S, Kimber W, Matarese G, Keogh JM, et al. Clinical and molecular genetic spectrum of congenital deficiency of the leptin receptor. N Engl J Med. 2007 Jan 18. 356(3):237-47. [Medline]. Lustig RH. Pediatric endocrine disorders of energy balance. Reviews in Endocrine & Metabolic Disorders. 2005. 6:245-260. [Medline]. Rongioletti F, Rebora A. Annular and semicircular lipoatrophies. Report of three cases and review of the literature. J Am Acad Dermatol. 1989 Mar. 20(3):433-6. [Medline]. Hodak E, David M, Sandbank M. Semicircular lipoatrophy--a pressure-induced lipoatrophy?. Clin Exp Dermatol. 1990 Nov. 15(6):464-5. [Medline]. BERARDINELLI W. An undiagnosed endocrinometabolic syndrome: report of 2 cases. J Clin Endocrinol Metab. 1954 Feb. 14(2):193-204. [Medline]. Seip M, Trygstad O. Generalized lipodystrophy, congenital and acquired (lipoatrophy). Acta Paediatr Suppl. 1996 Jun. 413:2-28. [Medline]. Bennett T, Allford M. Delayed emergence from anesthesia in a child with congenital generalized lipodystrophy (Berardinelli-Seip syndrome). Paediatr Anaesth. 2012 Mar. 22(3):299-300. [Medline]. Patni N, Garg A. Congenital generalized lipodystrophies-new insights into metabolic dysfunction. Nat Rev Endocrinol. 2015 Sep. 11 (9):522-34. [Medline]. Haghighi A, Kavehmanesh Z, Haghighi A, Salehzadeh F, Santos-Simarro F, Van Maldergem L, et al. Congenital generalized lipodystrophy: identification of novel variants and expansion of clinical spectrum. Clin Genet. 2015 Jun 15. [Medline]. Jaquet D, Khallouf E, Levy-Marchal C, Czernichow P. Extremely low values of serum leptin in children with congenital generalized lipoatrophy. Eur J Endocrinol. 1999 Jan. 140(1):107-9. [Medline]. Pardini VC, Victória IM, Rocha SM, Andrade DG, Rocha AM, Pieroni FB, et al. Leptin levels, beta-cell function, and insulin sensitivity in families with congenital and acquired generalized lipoatropic diabetes. J Clin Endocrinol Metab. 1998 Feb. 83(2):503-8. [Medline]. Faria CA, Moraes RS, Sobral-Filho DC, et al. Autonomic modulation in patients with congenital generalized lipodystrophy (Berardinelli-Seip syndrome). Europace. 2009 Jun. 11(6):763-9. [Medline]. Silver K, Walston J, Plotnick L, et al. Molecular scanning of beta-3-adrenergic receptor gene in total congenital lipoatrophic diabetes mellitus. J Clin Endocrinol Metab. 1997 Oct. 82(10):3395-8. [Medline]. Vigouroux C, Khallouf E, Bourut C, Robert JJ, de Kerdanet M, Tubiana-Rufi N, et al. Genetic exclusion of 14 candidate genes in lipoatropic diabetes using linkage analysis in 10 consanguineous families. J Clin Endocrinol Metab. 1997 Oct. 82(10):3438-44. [Medline]. Vigouroux C, Fajas L, Khallouf E, Meier M, Gyapay G, Lascols O, et al. Human peroxisome proliferator-activated receptor-gamma2: genetic mapping, identification of a variant in the coding sequence, and exclusion as the gene responsible for lipoatrophic diabetes. Diabetes. 1998 Mar. 47(3):490-2. [Medline]. Fu M, Kazlauskaite R, Baracho Mde F, Santos MG, Brandao-Neto J, Villares S, et al. Mutations in Gng3lg and AGPAT2 in Berardinelli-Seip congenital lipodystrophy and Brunzell syndrome: phenotype variability suggests important modifier effects. J Clin Endocrinol Metab. 2004 Jun. 89(6):2916-22. [Medline]. [Full Text]. Magre J, Delepine M, Khallouf E, Gedde-Dahl T Jr, Van Maldergem L, Sobel E, et al. Identification of the gene altered in Berardinelli-Seip congenital lipodystrophy on chromosome 11q13. Nat Genet. 2001 Aug. 28(4):365-70. [Medline]. Chen W, Yechoor VK, Chang BH, et al. The human lipodystrophy gene product Berardinelli-Seip congenital lipodystrophy 2/seipin plays a key role in adipocyte differentiation. Endocrinology. 2009 Oct. 150(10):4552-61. [Medline]. [Full Text]. Van Maldergem L, Bachy A, Feldman D, et al. Syndrome of lipoatrophic diabetes, vitamin D resistant rickets, and persistent Mullerian ducts in a Turkish boy born to consanguineous parents. Am J Med Genet. 1996 Aug 23. 64(3):506-13. [Medline]. Davis TM, Holdright DR, Schulenberg WE, Turner RC, Joplin GF. Retinal pigment epithelial change and partial lipodystrophy. Postgrad Med J. 1988 Nov. 64(757):871-4. [Medline]. Spranger S, Spranger M, Tasman AJ, Reith W, Voigtlander T, Voigtlander V. Barraquer-Simons syndrome (with sensorineural deafness): a contribution to the differential diagnosis of lipodystrophy syndromes. Am J Med Genet. 1997 Sep. 71(4):397-400. [Medline]. Yu CE, Oshima J, Wijsman EM, Nakura J, Miki T, Piussan C, et al. Mutations in the consensus helicase domains of the Werner syndrome gene. Werner's Syndrome Collaborative Group. Am J Hum Genet. 1997 Feb. 60(2):330-41. [Medline]. Cotton RB, Keats TE, McCoy EE. Abnormal blood glucose regulation in Cockayne's syndrome. Pediatrics. 1970 Jul. 46(1):54-60. [Medline]. Henning KA, Li L, Iyer N, McDaniel LD, Reagan MS, Legerski R, et al. The Cockayne syndrome group A gene encodes a WD repeat protein that interacts with CSB protein and a subunit of RNA polymerase II TFIIH. Cell. 1995 Aug 25. 82(4):555-64. [Medline]. Petersen MB, Brostrom K, Stibler H, Skovby F. Early manifestations of the carbohydrate-deficient glycoprotein syndrome. J Pediatr. 1993 Jan. 122(1):66-70. [Medline]. Aarskog D, Ose L, Pande H, Eide N. Autosomal dominant partial lipodystrophy associated with Rieger anomaly, short stature, and insulinopenic diabetes. Am J Med Genet. 1983 May. 15(1):29-38. [Medline]. Schwingshandl J, Mache CJ, Rath K, Borkenstein MH. SHORT syndrome and insulin resistance. Am J Med Genet. 1993 Nov 1. 47(6):907-9. [Medline]. Cutler DL, Kaufmann S, Freidenberg GR. Insulin-resistant diabetes mellitus and hypermetabolism in mandibuloacral dysplasia: a newly recognized form of partial lipodystrophy. J Clin Endocrinol Metab. 1991 Nov. 73(5):1056-61. [Medline]. Freidenberg GR, Cutler DL, Jones MC, Hall B, Mier RJ, Culler F. Severe insulin resistance and diabetes mellitus in mandibuloacral dysplasia. Am J Dis Child. 1992 Jan. 146(1):93-9. [Medline]. Breslau-Siderius EJ, Toonstra J, Baart JA, Koppeschaar HP, Maassen JA, Beemer FA, et al. Ectodermal dysplasia, lipoatrophy, diabetes mellitus, and amastia: a second case of the AREDYLD syndrome. Am J Med Genet. 1992 Oct 1. 44(3):374-7. [Medline]. Coleman S, Saboeiro A, Sengelmann R. A comparison of lipoatrophy and aging: volume deficits in the face. Aesthetic Plast Surg. 2009 Jan. 33(1):14-21. [Medline]. Garg A. Gender differences in the prevalence of metabolic complications in familial partial lipodystrophy (Dunnigan variety). J Clin Endocrinol Metab. 2000 May. 85(5):1776-82. [Medline]. Jackson SN, Pinkney J, Bargiotta A, Veal CD, Howlett TA, McNally PG, et al. A defect in the regional deposition of adipose tissue (partial lipodystrophy) is encoded by a gene at chromosome 1q. Am J Hum Genet. 1998 Aug. 63(2):534-40. [Medline]. Peters JM, Barnes R, Bennett L, Gitomer WM, Bowcock AM, Garg A. Localization of the gene for familial partial lipodystrophy (Dunnigan variety) to chromosome 1q21-22. Nat Genet. 1998 Mar. 18(3):292-5. [Medline]. Cao H, Hegele RA. Nuclear lamin A/C R482Q mutation in canadian kindreds with Dunnigan-type familial partial lipodystrophy. Hum Mol Genet. 2000 Jan 1. 9(1):109-12. [Medline]. Shackleton S, Lloyd DJ, Jackson SN, Evans R, Niermeijer MF, Singh BM, et al. LMNA, encoding lamin A/C, is mutated in partial lipodystrophy. Nat Genet. 2000 Feb. 24(2):153-6. [Medline]. Speckman RA, Garg A, Du F, et al. Mutational and haplotype analyses of families with familial partial lipodystrophy (Dunnigan variety) reveal recurrent missense mutations in the globular C-terminal domain of lamin A/C. Am J Hum Genet. 2000 Apr. 66(4):1192-8. [Medline]. Wilson KL. The nuclear envelope, muscular dystrophy and gene expression. Trends Cell Biol. 2000 Apr. 10(4):125-9. [Medline]. Heald R, McKeon F. Mutations of phosphorylation sites in lamin A that prevent nuclear lamina disassembly in mitosis. Cell. 1990 May 18. 61(4):579-89. [Medline]. Clements L, Manilal S, Love DR, Morris GE. Direct interaction between emerin and lamin A. Biochem Biophys Res Commun. 2000 Jan 27. 267(3):709-14. [Medline]. Bonne G, Di Barletta MR, Varnous S, Becane HM, Hammouda EH, Merlini L, et al. Mutations in the gene encoding lamin A/C cause autosomal dominant Emery-Dreifuss muscular dystrophy. Nat Genet. 1999 Mar. 21(3):285-8. [Medline]. Raffaele Di Barletta M, Ricci E, Galluzzi G, Tonali P, Mora M, Morandi L, et al. Different mutations in the LMNA gene cause autosomal dominant and autosomal recessive Emery-Dreifuss muscular dystrophy. Am J Hum Genet. 2000 Apr. 66(4):1407-12. [Medline]. Morris GE, Manilal S. Heart to heart: from nuclear proteins to Emery-Dreifuss muscular dystrophy. Hum Mol Genet. 1999. 8(10):1847-51. [Medline]. Brodsky GL, Muntoni F, Miocic S, Sinagra G, Sewry C, Mestroni L. Lamin A/C gene mutation associated with dilated cardiomyopathy with variable skeletal muscle involvement. Circulation. 2000 Feb 8. 101(5):473-6. [Medline]. Agarwal AK, Garg A. A novel heterozygous mutation in peroxisome proliferator-activated receptor-gamma gene in a patient with familial partial lipodystrophy. J Clin Endocrinol Metab. Jan 2002. 87(1):408-11. [Medline]. Akinci B, Koseoglu FD, Onay H, Yavuz S, Altay C, Simsir IY, et al. Acquired partial lipodystrophy is associated with increased risk for developing metabolic abnormalities. Metabolism. 2015 Sep. 64 (9):1086-95. [Medline]. Foss I, Trygstad O. Lipoatrophy produced in mice and rabbits by a fraction prepared from the urine from patients with congenital generalized lipodystrophy. Acta Endocrinol (Copenh). 1975 Oct. 80(2):398-416. [Medline]. Sissons JG, West RJ, Fallows J, et al. The complement abnormalities of lipodystrophy. N Engl J Med. 1976 Feb 26. 294(9):461-5. [Medline]. McLean RH, Hoefnagel D. Partial lipodystrophy and familial C3 deficiency. Hum Hered. 1980. 30(3):149-54. [Medline]. Wakefield MA. The interrelationship between hypocomplementaemia, partial lipodystrophy and mesangiocapillary glomerulonephritis. Postgrad Med J. 1976 Oct. 52(612):651-2. [Medline]. Jasin HE. Systemic lupus erythematosus, partial lipodystrophy and hypocomplementemia. J Rheumatol. 1979 Jan-Feb. 6(1):43-50. [Medline]. Fontaine M, Daveau M, Lebreton JP, Dumouchel L, Vannier JP, Godin M. Evidence that an autoantibody of IgG3 subclass against C3b discloses a C3 Nef activity in a pateint with partial lipodystrophy and glomerulonephritis. Ann Immunol (Paris). 1980 Jan-Feb. 131C(1):39-53. [Medline]. Commens C, O'Neill P, Walker G. Dermatomyositis associated with multifocal lipoatrophy. J Am Acad Dermatol. 1990 May. 22(5 Pt 2):966-9. [Medline]. Sasaki T, Ono H, Nakajima H, Sugimoto J. Lipoatrophic diabetes. J Dermatol. 1992 Apr. 19(4):246-9. [Medline]. Kavanagh GM, Colaco CB, Kennedy CT. Juvenile dermatomyositis associated with partial lipoatrophy. J Am Acad Dermatol. 1993 Feb. 28(2 Pt 2):348-51. [Medline]. Lawrence RD. Lipodystrophy and hepatomegaly with diabetes, lipaemia, and other metabolic disturbances: a case throwing new light on the action of insulin. Lancet. 1946. 1:724-31, 773-5. Iglesias P, Alvarez Fidalgo P, Codoceo R, Diez JJ. Lipoatrophic diabetes in an elderly woman: clinical course and serum adipocytokine concentrations. Endocr J. Jun 2004. 51(3):279-86. [Medline]. [Full Text]. Hubler A, Abendroth K, Keiner T, Stocker W, Kauf E, Hein G, et al. Dysregulation of insulin-like growth factors in a case of generalized acquired lipoatrophic diabetes mellitus (Lawrence Syndrome) connected with autoantibodies against adipocyte membranes. Exp Clin Endocrinol Diabetes. 1998. 106(1):79-84. [Medline]. Perrot H, Delaup JP, Chouvet B. [Barraquer and Simons lipodystrophy. Complement anomalies and cutaneous leukocytoclasic vasculitis]. Ann Dermatol Venereol. 1987. 114(9):1083-91. [Medline]. Biasi D, Caramaschi P, Carletto A, Bambara LM. A case of acquired partial lipodystrophy associated with localized scleroderma and undifferentiated connective tissue disease. Rheumatol Int. 1999. 19(1-2):75-6. [Medline]. Zhang B, MacNaul K, Szalkowski D, Li Z, Berger J, Moller DE. Inhibition of adipocyte differentiation by HIV protease inhibitors. J Clin Endocrinol Metab. 1999 Nov. 84(11):4274-7. [Medline]. Wentworth JM, Burris TP, Chatterjee VK. HIV protease inhibitors block human preadipocyte differentiation, but not via the PPARgamma/RXR heterodimer. J Endocrinol. 2000 Feb. 164(2):R7-R10. [Medline]. Christeff N, Melchior JC, de Truchis P, Perronne C, Nunez EA, Gougeon ML. Lipodystrophy defined by a clinical score in HIV-infected men on highly active antiretroviral therapy: correlation between dyslipidaemia and steroid hormone alterations. AIDS. 1999 Nov 12. 13(16):2251-60. [Medline]. Vigouroux C, Gharakhanian S, Salhi Y, Nguyen TH, Chevenne D, Capeau J, et al. Diabetes, insulin resistance and dyslipidaemia in lipodystrophic HIV- infected patients on highly active antiretroviral therapy (HAART). Diabetes Metab. 1999 Sep. 25(3):225-32. [Medline]. Saint-Marc T, Partisani M, Poizot-Martin I, Rouviere O, Bruno F, Avellaneda R, et al. Fat distribution evaluated by computed tomography and metabolic abnormalities in patients undergoing antiretroviral therapy: preliminary results of the LIPOCO study. AIDS. 2000 Jan 7. 14(1):37-49. [Medline]. Burant CF, Sreenan S, Hirano K, Tai TA, Lohmiller J, Lukens J, et al. Troglitazone action is independent of adipose tissue. J Clin Invest. 1997 Dec 1. 100(11):2900-8. [Medline]. Moitra J, Mason MM, Olive M, Krylov D, Gavrilova O, Marcus-Samuels B, et al. Life without white fat: a transgenic mouse. Genes Dev. 1998 Oct 15. 12(20):3168-81. [Medline]. Shimomura I, Hammer RE, Richardson JA, et al. Insulin resistance and diabetes mellitus in transgenic mice expressing nuclear SREBP-1c in adipose tissue: model for congenital generalized lipodystrophy. Genes Dev. 1998 Oct 15. 12(20):3182-94. [Medline]. Gavrilova O, Marcus-Samuels B, Graham D, Kim JK, Shulman GI, Castle AL, et al. Surgical implantation of adipose tissue reverses diabetes in lipoatrophic mice. J Clin Invest. 2000 Feb. 105(3):271-8. [Medline]. Jéquier E, Felber JP. Indirect calorimetry. Baillieres Clin Endocrinol Metab. 1987 Nov. 1(4):911-35. [Medline]. Lillioja S, Bogardus C. Obesity and insulin resistance: lessons learned from the Pima Indians. Diabetes Metab Rev. 1988 Aug. 4(5):517-40. [Medline]. Unger RH. Lipotoxicity in the pathogenesis of obesity-dependent NIDDM. Genetic and clinical implications. Diabetes. 1995 Aug. 44(8):863-70. [Medline]. Wang MY, Lee Y, Unger RH. Novel form of lipolysis induced by leptin. J Biol Chem. 1999 Jun 18. 274(25):17541-4. [Medline]. James OF, Day CP. Non-alcoholic steatohepatitis (NASH): a disease of emerging identity and importance. J Hepatol. 1998 Sep. 29(3):495-501. [Medline]. US Food and Drug Administration. FDA approves Myalept to treat rare metabolic disease. February 24, 2014. Available at http://www.fda.gov/NewsEvents/Newsroom/PressAnnouncements/ucm387060.htm. Accessed: February 28, 2014. Nainggolan L. Myalept (metreleptin) approved for generalized lipodystrophy. Medscape Medical News. February 25, 2014. Available at http://www.medscape.com/viewarticle/82105. Accessed: February 28, 2014. Chan JL, Lutz K, Cochran E, Huang W, Peters Y, Weyer C, et al. Clinical effects of long-term metreleptin treatment in patients with lipodystrophy. Endocr Pract. 2011 Nov-Dec. 17(6):922-32. [Medline]. [Full Text]. Rodriguez AJ, Mastronardi CA, Paz-Filho GJ. New advances in the treatment of generalized lipodystrophy: role of metreleptin. Ther Clin Risk Manag. 2015. 11:1391-400. [Medline]. Lebastchi J, Ajluni N, Neidert A, Oral EA. A Report of Three Cases with Acquired Generalized Lipodystrophy with Distinct Autoimmune Conditions treated with Metreleptin. J Clin Endocrinol Metab. 2015 Sep 21. jc20152589. [Medline]. Oral EA, Simha V, Ruiz E, Andewelt A, Premkumar A, Snell P, et al. Leptin-replacement therapy for lipodystrophy. N Engl J Med. Feb 2002. 346(8):570-8. [Medline]. [Full Text]. Javor ED, Cochran EK, Musso C, Young JR, Depaoli AM, Gorden P. Long-term efficacy of leptin replacement in patients with generalized lipodystrophy. Diabetes. Jul 2005. 54(7):1994-2002. [Medline]. [Full Text]. Ebihara K, Kusakabe T, Hirata M, Masuzaki H, Miyanaga F, Kobayashi N, et al. Efficacy and safety of leptin-replacement therapy and possible mechanisms of leptin actions in patients with generalized lipodystrophy. J Clin Endocrinol Metab. Feb 2007. 92(2):532-41. [Medline]. Musso C, Cochran E, Javor E, Young J, Depaoli AM, Gorden P. The long-term effect of recombinant methionyl human leptin therapy on hyperandrogenism and menstrual function in female and pituitary function in male and female hypoleptinemic lipodystrophic patients. Metabolism. Feb 2005. 54(2):255-63. [Medline]. Kamran F, Rother KI, Cochran E, Safar Zadeh E, Gorden P, Brown RJ. Consequences of Stopping and Restarting Leptin in an Adolescent with Lipodystrophy. Horm Res Paediatr. 2012 Sep 4. [Medline]. Nathan DM, Roussell A, Godine JE. Glyburide or insulin for metabolic control in non-insulin-dependent diabetes mellitus. A randomized, double-blind study. Ann Intern Med. 1988 Mar. 108(3):334-40. [Medline]. Bressler R, Johnson DG. Pharmacological regulation of blood glucose levels in non-insulin-dependent diabetes mellitus. Arch Intern Med. 1997 Apr 28. 157(8):836-48. [Medline]. Tontonoz P, Hu E, Spiegelman BM. Stimulation of adipogenesis in fibroblasts by PPAR gamma 2, a lipid-activated transcription factor. Cell. 1994 Dec 30. 79(7):1147-56. [Medline]. Inzucchi SE, Maggs DG, Spollett GR, Page SL, Rife FS, Walton V, et al. Efficacy and metabolic effects of metformin and troglitazone in type II diabetes mellitus. N Engl J Med. 1998 Mar 26. 338(13):867-72. [Medline]. Maggs DG, Buchanan TA, Burant CF, Cline G, Gumbiner B, Hsueh WA, et al. Metabolic effects of troglitazone monotherapy in type 2 diabetes mellitus. A randomized, double-blind, placebo-controlled trial. Ann Intern Med. 1998 Feb 1. 128(3):176-85. [Medline]. Arioglu E, Duncan-Morin J, Sebring N, Rother KI, Gottlieb N, et al. Efficacy and safety of troglitazone in the treatment of lipodystrophy syndromes. Ann Intern Med. 2000 Aug 15. 133(4):263-74. [Medline]. Fischer P, Moller P, Bindl L, Melzner I, Tornqvist H, Debatin KM, et al. Induction of adipocyte differentiation by a thiazolidinedione in cultured, subepidermal, fibroblast-like cells of an infant with congenital generalized lipodystrophy. J Clin Endocrinol Metab. 2002 May. 87(5):2384-90. [Medline]. [Full Text]. Bolan C, Oral EA, Gorden P, et al. Intensive, long-term plasma exchange therapy for severe hypertriglyceridemia in acquired generalized lipoatrophy. J Clin Endocrinol Metab. Jan 2002. 87(1):380-4. [Full Text]. Shimomura I, Hammer RE, Ikemoto S, Brown MS, Goldstein JL. Leptin reverses insulin resistance and diabetes mellitus in mice with congenital lipodystrophy. Nature. 1999 Sep 2. 401(6748):73-6. [Medline]. Gavrilova O, Marcus-Samuels B, Leon LR, Vinson C, Reitman ML. Leptin and diabetes in lipoatrophic mice. Nature. 2000 Feb 24. 403(6772):850; discussion 850-1. [Medline]. Utzschneider KM, Trence DL. Effectiveness of gastric bypass surgery in a patient with familial partial lipodystrophy. Diabetes Care. JUn 2006. 29(6):1380-2. [Medline]. [Full Text]. Kasper DL. The lipodystrophies and other rare disorders of the adipose tissue. Isselbacher KJ, Braunwald E, Wilson JD, Fauci A. Harrison's Principles of Internal Medicine. 13th ed. McGraw-Hill: New York, NY; 1994. 2131-6.